Double Coated Tapes for Industrial Use | J.V. Converting Company, Inc.
JVCC DC-4109RS Double Coated Film Tape is a polyester film substrate coated on both sides with a modified solvent-free water-based acrylic adhesive. Used for splicing of various materials such as papers, plastics, films and foils. Can be used for mounting nameplates, keyboard assembly, and laminating dissimilar metals. 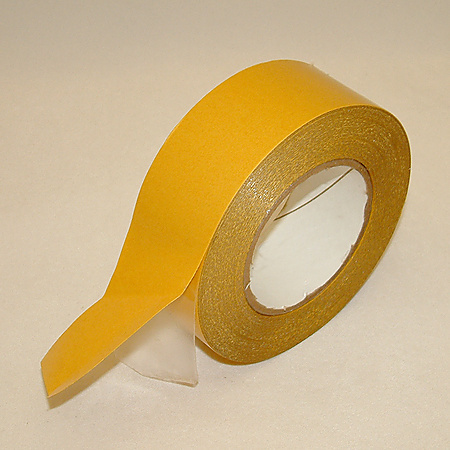 DC-4109RS’s adhesion (29 ounces per inch) is comparable to a general-purpose masking tape. JVCC DC-4109RS Comes on a gold siliconized paper liner. Superior moisture resistance in high humidity. Excellent low and high temperature performance. Temperature Resistance up to 392°F short term. JVCC DC-4420LB Double Coated PVC Tape is a PVC film coated on both sides with a water based acrylic adhesive. On a gold siliconized paper liner. The adhesive system of this two-sided tape is very aggressive and will bond to nearly all materials (even on difficult surfaces like foams, PE and PP films). Has excellent temperature, UV, aging, and water vapor resistance. Used for bonding rubber, plastic, metal, and wood substrates and for permanent mounting of nameplates, posters and mats. Also for hemming vinyl banners and decorative trim on appliances and furniture. Has a one hour dwell before adhesion reaches maximum. JVCC DCP-03 Double Coated Heavy Paper Tape is a white paper coated on both sides with an aggressive modified water-based acrylic adhesive; comes on a gold siliconized paper liner. It has good dynamic and static shear strength. No plasticizer migration on most surfaces. Good water-vapor, temperature, UV, and aging resistance. Moderate resistance to chemicals (should be tested first). Excellent corrugated splicing tape. JVCC DCP-03 Double-Sided Paper Tape is also used for other holding, joining, attaching and laminating applications. Adhesive has 1 hour dwell time.